The World Cup 2010 provided an opportunity for South African cities to be reimagined. The investment and infrastructural impetus of the mega event became a catalyst for many public space and public transport projects, which sought to rewire South African cities into more connected, better integrated, more accessible and thus more democratic urban environments. Design was a central component of the World Cup. A diverse range of local and international creative professions were rallied to make the event the success it became – from architects, to graphic designers, urban planners and artists – all were essential. More importantly however, is the fact that these key problem solving skills were sharpened during the World Cup, and a bank of experienced design professionals are now better able to assist South Africa, and other global countries in their future development. Reflections & Opportunities: Design, Cities and the World Cup grapples with the challenges and solutions of the World Cup, and in particular, with regards to design and city making. The landmark publication directly questions the role the World Cup played in forging a greater South African identity. It examines the ambitious public space and transport projects that came with the event and, in general, develops a critical dialogue around the design, implementation and effect of the event. The publication is seen as the first step in fostering a global discussion on the role of mega events in cities, and how they can be better used to catalyse urban solutions, be they spatial, social or infrastructure oriented. The book is also the first formal gesture from a South African organisation, DESIGNING_SOUTHAFRICA, to share experiences and information with the hosts of the next World Cup and Olympic Games, Brazil. The publication can be understood as a conduit for exchange between the two nations, ensuring that the lessons learned from one event can better inform the next. For South Africa, Reflections & Opportunities presents a platform for a greater debate on the role of the World Cup in improving the lives of urban residents, while for Brazil, it offers a carefully curated precedent. The full colour, large format publication can be read in both English and Portuguese by flipping the book over – English designated by a bold, blue title on one side, and Portuguese in green on the other. The book, divided into two sections entitled Reflections, and the other, Opportunities contains ten articles by leading international and local press houses, and four essays by key academics. 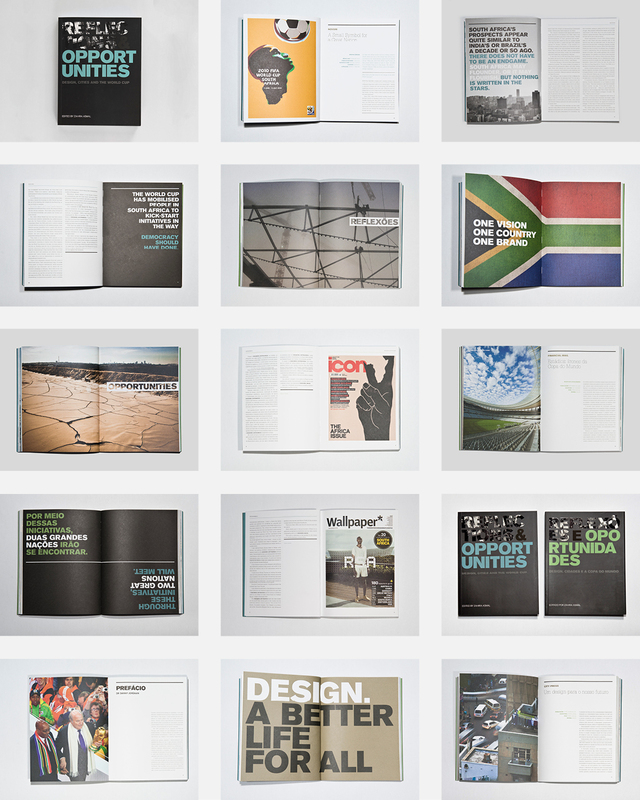 Contributors include the African Centre for Cities director Professor Edgar Pieterse, architect Henning Rasmuss, Oliver Stuenkel – International Relations Professor (FGV – São Paulo), CPUT Professor Brendan Knott and articles from Wallpaper*, The Financial Times and Icon to name a few. The publication features a foreword by the South African Local Organising Committee head for the World Cup, Dr Danny Jordaan, and an introduction by the editor Zahira Asmal. All articles and essays are presented in between striking images and photographs by Andrew Bell, and South Africa’s most accomplished and revered photographer, David Goldblatt. Reflections & Opportunities was presented over 25 events in 17 cities globally.